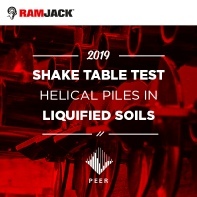 Ram Jack (www.ramjack.com) couldn’t be more excited about a new opportunity to showcase the strength and durability of their Ram Jack helical piles. They were invited by the University of Nevada, Reno, to take part in their new shake table experiment on helical piles in liquified soils, sponsored and endorsed by the Pacific Earthquake Engineering Research Center (PEER). With a rich history of manufacturing their own products and paving the way in the foundation industry, Ram Jack understand the need for constant improvement and the need highly tested quality products. During this test, Ram Jack’s helical piles will be tested for remedial underpinning during liquefaction caused by seismic events. Being the first test of its kind, this full-scale test of helical retrofit piles will allow Ram Jack to support an even wider range of projects and locations in seismic areas. This experiment is scheduled for the first week of April 2019. Ram Jack looks forward to seeing the results of this game-changing experiment.